Businesses are built on systems and processes—a company couldn’t operate without them. From lead nurturing methods to the way a team interacts with customers, nearly everything a business does involves a system of some sort. And, when it comes to systems and processes, efficiency is everything. In some cases, shaving even a minute or two off can lead to substantial savings. There are countless ways to analyze and improve efficiency, but one that stands out is through data flow diagrams. Whether you are improving an existing process or implementing a new one, a data flow diagram (DFD) will make the task easier. However, if you’ve never created a DFD before, getting started can be intimidating. There is a lot to take in: different levels of diagrams, symbols and notation, not to mention actually creating the diagram—navigating it all will take more than looking at a few examples. 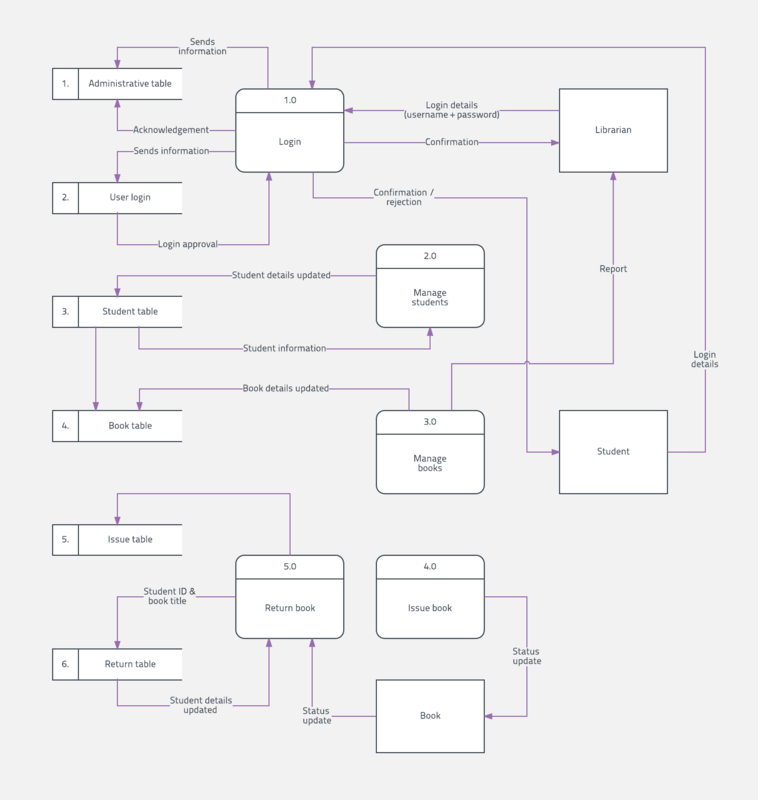 If you’re new to data flow diagrams, this guide will help get you started. A data flow diagram shows the way information flows through a process or system. It includes data inputs and outputs, data stores, and the various subprocesses the data moves through. DFDs are built using standardized symbols and notation to describe various entities and their relationships. Data flow diagrams visually represent systems and processes that would be hard to describe in a chunk of text. You can use these diagrams to map out an existing system and make it better or to plan out a new system for implementation. Visualizing each element makes it easy to identify inefficiencies and produce the best possible system. For more information on data flow diagrams, read our in-depth article. Before actually creating your data flow diagram, you’ll need to determine whether a physical or logical DFD best suits your needs. If you’re new to data flow diagrams, don’t worry—the distinction is pretty straightforward. Logical data flow diagrams focus on what happens in a particular information flow: what information is being transmitted, what entities are receiving that info, what general processes occur, etc. The processes described in a logical DFD are business activities—a logical DFD doesn’t delve into the technical aspects of a process or system. 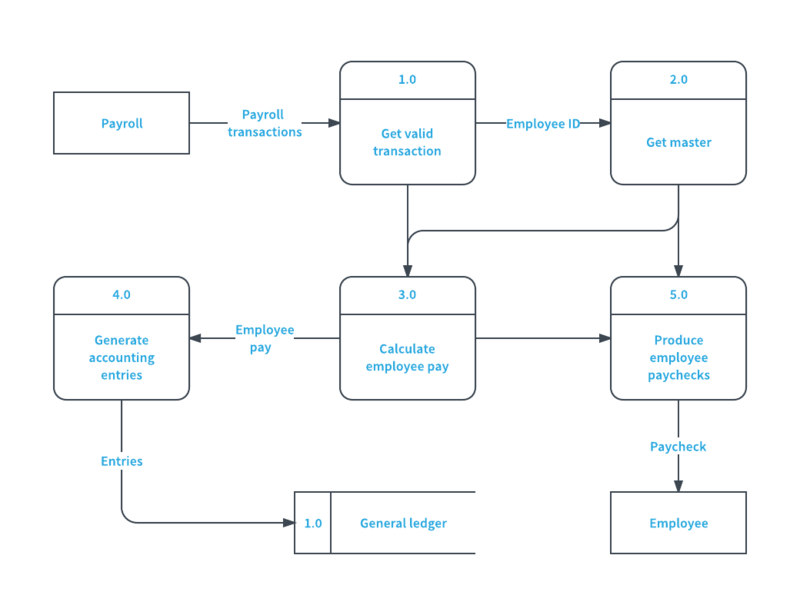 Non-technical employees should be able to understand these diagrams. Physical data flow diagrams focus on how things happen in an information flow. These diagrams specify the software, hardware, files, and people involved in an information flow. A detailed physical data flow diagram can facilitate the development of the code needed to implement a data system. Create your free Lucidchart account! Both physical and logical data flow diagrams can describe the same information flow. In coordination they provide more detail than either diagram would independently. As you decide which to use, keep in mind that you may need both. Want more info on physical and logical DFDs? Read more. Data flow diagrams are also categorized by level. Starting with the most basic, level 0, DFDs get increasingly complex as the level increases. As you build your own data flow diagram, you will need to decide which level your diagram will be. Level 0 DFDs, also known as context diagrams, are the most basic data flow diagrams. They provide a broad view that is easily digestible but offers little detail. Level 0 data flow diagrams show a single process node and its connections to external entities. Level 1 DFDs are still a general overview, but they go into more detail than a context diagram. In a level 1 data flow diagram, the single process node from the context diagram is broken down into subprocesses. As these processes are added, the diagram will need additional data flows and data stores to link them together. Level 2+ DFDs simply break processes down into more detailed subprocesses. In theory, DFDs could go beyond level 3, but they rarely do. Level 3 data flow diagrams are detailed enough that it doesn’t usually make sense to break them down further. 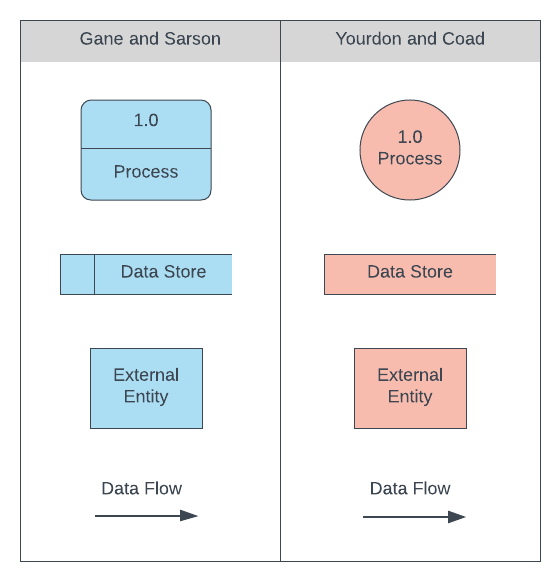 Depending on the methodology (Gane and Sarson vs. Yourdon and Coad), DFD symbols vary slightly. However, the basic ideas remain the same. There are four basic elements of a data flow diagram: processes, data stores, external entities, and data flows. The picture below shows the standard shapes for both methodologies. If you’re unsure how to use each symbol, read our DFD symbols guide. Nearly every process or system begins with input from an external entity and ends with the output of data to another entity or database. Identifying such inputs and outputs gives a macro view of your system—it shows the broadest tasks the system should achieve. The rest of your DFD will be built on these elements, so it is crucial to know them early on. Once you’ve identified the major inputs and outputs, building a context diagram is simple. Draw a single process node and connect it to related external entities. This node represents the most general process information undergoes to go from input to output. The example below shows how information flows between various entities via an online community. Data flows to and from the external entities, representing both input and output. The center node, “online community,” is the general process. The single process node of your context diagram doesn’t provide much information—you need to break it down into subprocesses. In your level 1 data flow diagram, you should include several process nodes, major databases, and all external entities. Walk through the flow of information: where does the information start and what needs to happen to it before each data store? To enhance the detail of your data flow diagram, follow the same process as in step 3. The processes in your level 1 DFD can be broken down into more specific subprocesses. Once again, ensure you add any necessary data stores and flows—at this point you should have a fairly detailed breakdown of your system. To progress beyond a level 2 data flow diagram, simply repeat this process. Stop once you’ve reached a satisfactory level of detail. When your diagram is completely drawn, walk through it. Pay close attention to the flow of information: does it make sense? Are all necessary data stores included? By looking at your final diagram, other parties should be able to understand the way your system functions. Before presenting your final diagram, check with co-workers to ensure your diagram is comprehensible. After completing your DFD, the next step is sharing it. You didn’t create it just to keep to yourself—whether it’s team members, your boss, or stakeholders, chances are somebody else needs to see it. If you use Lucidchart to create a data flow diagram, you’ll have a variety of sharing options at your disposal. Diagrams can be sent directly within Lucidchart, giving the recipient access to the Lucidchart document. Depending on the recipient’s role, you can give them permission to edit or send the diagram as view only. Lucidchart’s extensive integrations allow for diagram sharing across several other platforms including G Suite and Slack. To get diagramming, sign up for your free Lucidchart account now.